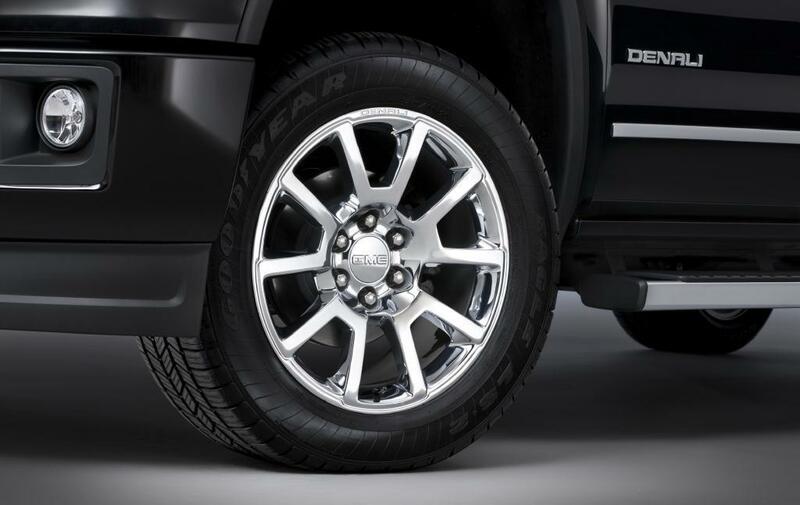 GMC has been a leader in raising the luxury level available in light trucks and SUVs with its Denali line. Two of every ten GMC buyers opted for Denali models last year. That success has spanned new competition in the form of Chevrolet's 2014 Silverado High Country and Ford's 2013 F-150 Limited. But GMC isn't ceding any ground to these newcomers. 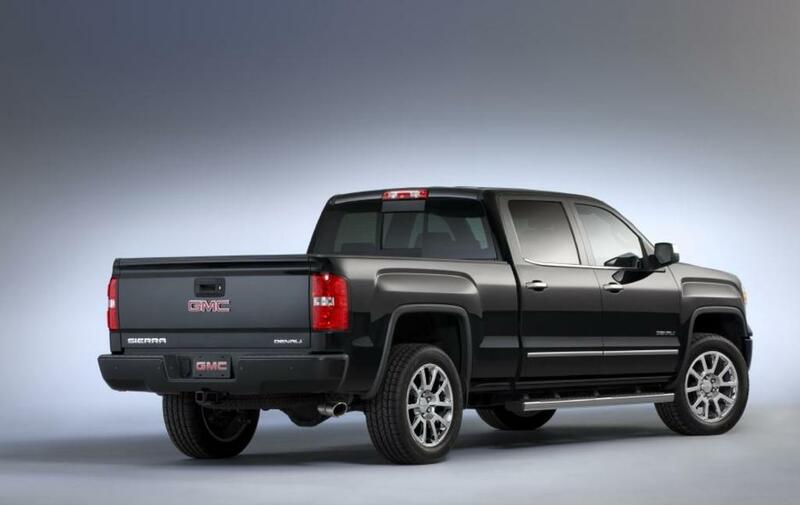 The all-new 2014 Sierra 1500 Denali full-size pickup, which arrives this fall, will feature an available 6.2L EcoTec3 V-8 that generates an estimated 420 horsepower and 450 lb-ft of torque – the most power and torque of any light duty truck engine, according to GMC. Final SAE-certified power and torque numbers will be available later this year. The 6.2L V-8 will also be available for Sierra SLT models (as well as some Chevrolet Silverado models) this fall. With that engine, GM says, the Sierra is expected to have a class-leading maximum trailer towing capacity of 5455 kg (12,000 lb). The standard engine is a 5.3L EcoTec3 V-8, rated at 355 horsepower. It is said to boast better EPA-estimated fuel economy than any other V-8 or turbocharged V-6 pickup on the market. Design cues for the 2014 Sierra Denali follow the same formula that has worked so well in the past. Exterior features include a signature Denali chrome grille, unique 20-inch chrome wheels, unique interior decorative trim, a polished stainless steel exhaust outlet and body-color front and rear bumpers. Denali-specific interior details include Denali script on the bright door sills and embossed into the front seats and real aluminum trim. 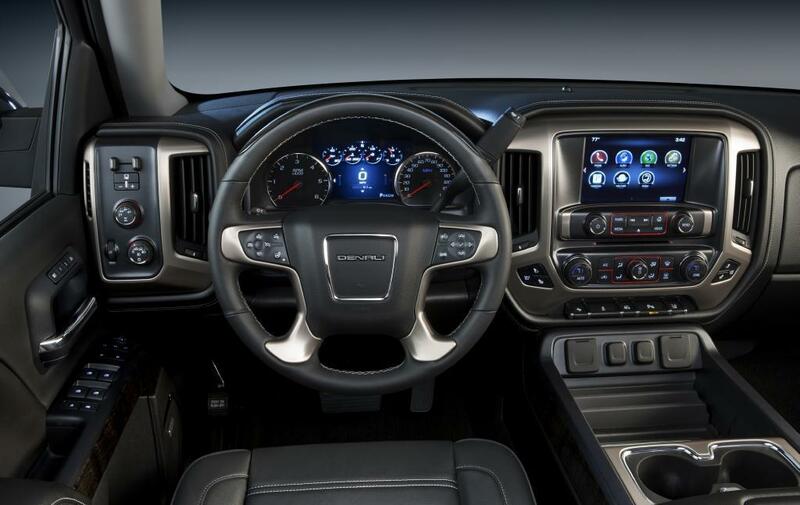 Other features include an exclusive eight-inch Customizable Driver Display that can show relevant settings, audio and navigation information in the instrument panel. The Denali’s standard eight-inch Color Touch navigation radio with Intellilink, located above the centre console, serves as the main hub for Bluetooth-connected phones and portable devices connected through five standard USB ports. Other standard features include projector-style headlamps with LED signature daytime running lights, a Bose audio system, heated and cooled leather front bucket seats, a heated steering wheel, front and rear park assist and a power sliding rear window with defogger.